Declan Butler, a senior editor at Nature magazine and author of the excellent Avian Flu Google Earth map, has recently told us that the latest issue of Nature includes several interesting technology stories with the title of the issue called "2020 Vision". The stories in the issue are available online for free thanks to a sponsorship with Microsoft whose 2020 Report formed the basis of this issue. Declan wrote an excellent story about the future of sensor networks, or sensor webs as he likes to call them entitled: "2020 computing, Everything everwhere". Make sure you read Declan's blog entry which includes links to all the stories in the issue. Also of note, Alan Glennon at the University of California at Santa Barbara wrote his thoughts on Declan's article. Having worked at NASA, I appreciated Alan's point that pervasive sensor networks will result in massive ignored data problems. "Sensors and sensor networks provide coordinated, simultaneous, multi-modal observations of small-scale temporal and spatial ecosystem processes", according to CENS. 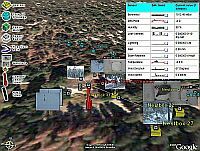 Viewing of spatial information is GE's forte. Declan Butler pointed out that Brian McClendon, who is the director of Engineering for Google Earth, told him about an example of a real-time sensor network already showing its results in GE right now. The network was put in place by University of California students at the James Reserve - a protected wilderness area to the east of San Jacinto, California. The James Reserve sensor network project includes sensors for measuring the climate/microclimate, towers for sensors, bird nests with video cameras, bird feeders, plant monitors, and more. You can download the James Reserve network link now and see the variety of information available. This is an excellent beginning to their GE data and includes 3D models of towers and other databoxes, placemarks, and links showing the network layout. 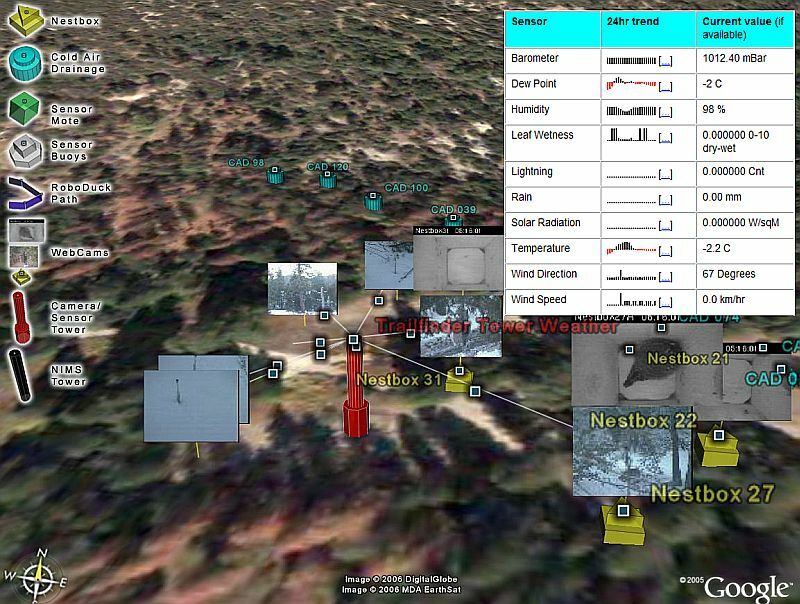 Click on the towers, bird nests, or other sensor placemarks to see more information. Some of the placemarks pull up a variety of graphs and data showing measurements for that sensor location. Others have web cam photos, and a few even have links to a web site where you can take control of the camera. The UC students have a GIS database which shows the locations of all the sensors, this aided their development of the Google Earth data. The James Reserve web site indicates they plan to release tutorials and video demos soon. Here's a link to more information about the James Reserve which can only be visited by applying for permission from the University of California.